One of the new members of the Weekends in Rotterdam writers is Matthijs Vegter. Next to working as a cameraman, he is very familiar with writing as he has a background in blogging. 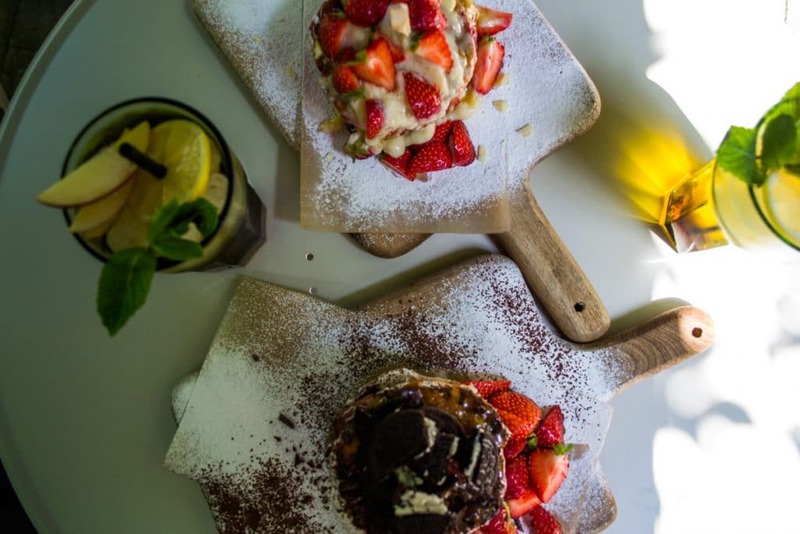 Matthijs kicks off his guest blogger role with a review of some delicious pancakes at Arzu The Foodbar Supplier in Rotterdam. Enjoy! Arzu The Foodbar Supplier is a breakfast and lunch restaurant on the Bergweg in Rotterdam-Noord, about a five-minute drive from the center. What stands out at first sight is the possibility to sit outside on the terrace. This means that when the sun is out, you do not have to melt away while sitting inside, but you can enjoy the weather! If it’s bad weather or you just prefer to go inside, that’s possible as well. If you want to sit outside, but not next to the busy streets, you can even sit in the garden of Arzu for a place in the shade. Before you have found yourself a seat, you first walk past the counter, where your heart (as a sweet tooth) will beat faster. 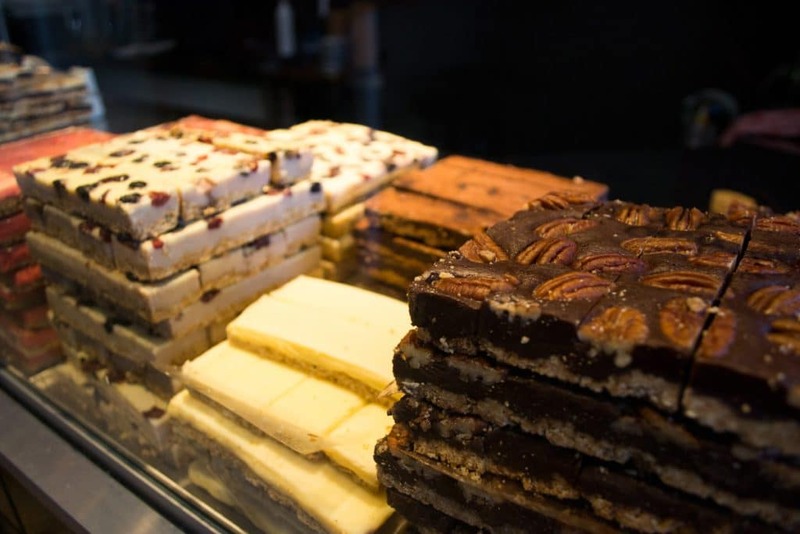 Not only is it possible to have some breakfast and lunch at Arzu, but as the name suggests, you can also buy home-made food bars here, which are available in over twenty flavors. You’ll start mouth-watering right away! Honestly, I did not come for the food bars, but for something else that Arzu has to offer. I was invited by my favorite colleague Mathilde to write this piece. Which is fine and all, but my only demand was that we had to go to a place where pancakes are printed thick on the menu. And luckily I was not disappointed, because on the menu (which looks a bit boring in my humble opinion, but who cares …) there are no fewer than thirteen kinds of pancakes. My eye immediately fell on the Oreo variant, a brownie pancake with bits of Oreo and dark chocolate. Mathilde chose the red velvet pancake with cream cheese and white chocolate, and as an extra optional ingredient we took strawberries. After we had been served our pancakes (on a nice wooden board sprinkled with powdered sugar) and both had made way too many pictures of these beautiful artworks, it was of course time to taste … And … Delicious! My Oreo pancake tasted just as good as it looks. You pay € 8.50 for an Oreo pancake and € 7.70 for the red velvet variant. The other pancakes are around the same price. An extra ingredient (choose from whipped cream, fruit, nutella, oreo, nuts or ice cream) costs € 0.50. Besides pancakes you can also order different sandwiches and super healthy bowls, but that’s for the next time! 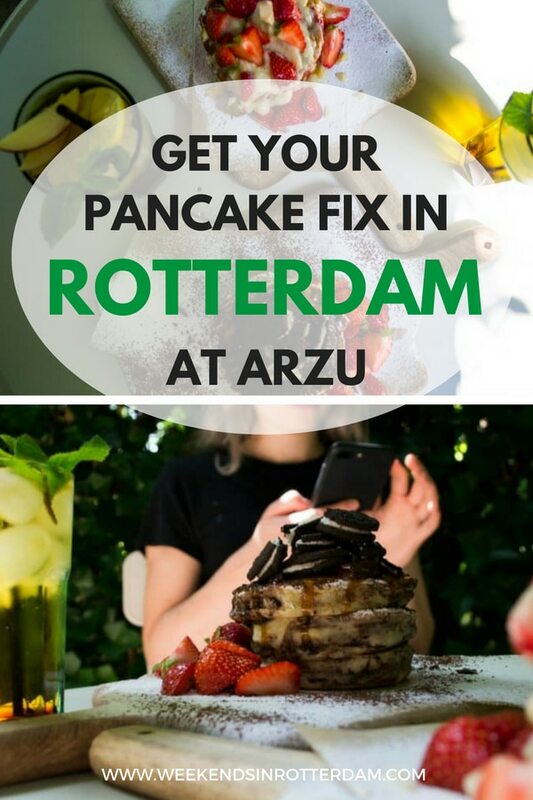 Have you already been to Arzu in Rotterdam? Let us know what you think below! 5 Summer must-do's with the Rotterdampas!